Workers today have many tools intended to make their lives easier and more productive -- including innovative workwear with advanced design, like these Wrangler Riggs Men's Dark Khaki 3W020 DK Cotton Ripstop Carpenter Jeans. Having a good pair of work pants is just ... (see full details) (see specifications) #WRG3W020DK. 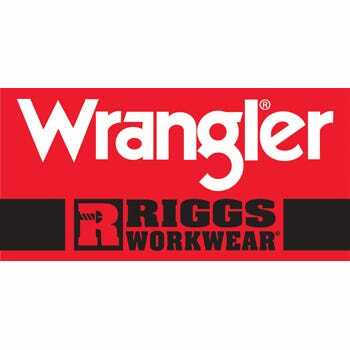 Workers today have many tools intended to make their lives easier and more productive -- including innovative workwear with advanced design, like these Wrangler Riggs Men's Dark Khaki 3W020 DK Cotton Ripstop Carpenter Jeans. Having a good pair of work pants is just as important as having the right tools, and these ripstop jeans get the job done. These carpenter pants by Wrangler are designed with the Room2move® fit, giving you more than enough mobility to get around on the worksite. They have an improved relaxed fit in the seat, thigh, knee and bottom opening of the pant leg. These dark khaki jeans also have an action gusset crotch, extra cloth to give them added room and reinforcement. Built tough, these work jeans are made from 10-ounce 100% cotton ripstop fabric that helps prevent small tears from spreading. All of the seams have triple-needle stitching for additional strength, and they're constructed with a tough #5 YKK brass zipper. The beefy 3/4-inch x 2 1/4-inch belt loops stand up to your work belt. These relaxed-fit carpenter work pants have useful features like an oversized watch pocket and 13-inch deep front pockets with 7.25 oz. white pocketing material. This is great when you need extra storage, plus the heavier material means they won't wear out as easily. There is also a useful protective tape measure reinforcement on the right front pocket. The back pockets are lined with 1000-Denier Cordura® fabric, to help prevent wear no matter what you stuff into them. They're also reinforced at stress areas that always seem to be the first parts to wear out. For added convenience, these work jeans have a hammer loop on the right side. Take advantage of all the great advancements that today's workers enjoy, including the unparalleled level of quality in these Wrangler Riggs Men's Dark Khaki 3W020 DK Cotton Ripstop Carpenter Jeans. Order yours today from the workwear experts at Working Person's Store! These jeans are made for hard working men, that are HARD on jeans, nothing even comes CLOSE!! You can count on these jeans standing up to rugged wearing. If my husband doens't wear them out, then your's won't either. Easy ordering too. As others have stated here, these jeans are great and hold up wash after wash. I found that not drying makes them look better. I just crease and hang to dry. Will order here because of free shipping! While I did not order these jeans from the working persons store i do own a pair and must say they are the best pants that I own. I am a carpenter and work outside a lot and was surprised when I got these pants wet to find out that they do not stick to your skin like other cotton type pants do thus constricting your freedom of movement. These pants are light and durable and I would recomend them to anyone over any of the other brands. Try them you'll like them! I got a tell ya that the jeans are really good. Cant get any mbetter than them. Wrangler Riggs Jeans: Men's Dark Khaki 3W020 DK Cotton Ripstop Carpenter Jeans is being added to your cart.